What's on your bookshelf... besides dust? I admit, there's a lot of dust on my shelves. Partly it's because I'm a lousy housekeeper. Mostly it's because when I get near my bookshelves, I more likely to start reading than cleaning. I grew up in a family that loved to read. In the basement, I have a small library (by Carnegie standards) of paperbacks I've collected or inherited from my parents. My office is over-flowing. One bookshelf is devoted to reference material. My desk is lined up with dictionaries and the like. Another crate and board unit has over-sized books, graphic novels and my old manuscripts. Then there's bookshelves in my bedroom which contain my old friends - and some new ones - including my own books. 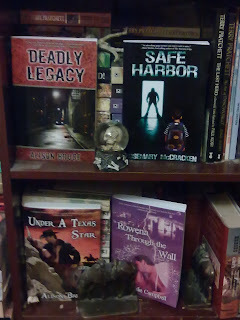 Under A Texas Star leans against a stack of Georgette Heyer historicals. Behind Deadly Legacy is my Terry Pratchett Discworld collection. What's on your bookshelf? 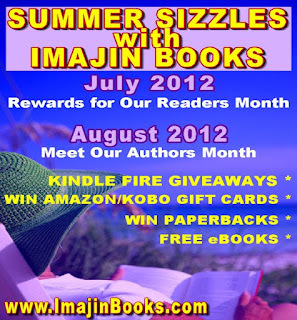 If there's an Imajin Book there (or on your Kindle) you could win an Amazon gift certificate.